Get away from Pollution and Enjoy a Fresh Sea Breezy, Quite and Relaxing Accommodation in Coral Blue Oriental Villas & Suites, at Talisay, Sta Fe, Bantayan Island, Northern Cebu. Our Villas and Suites are located in a Tropical Island with absolute beachfront, Ten (10) meters from the Ocean Shorelines, and a picturestique ocean view. 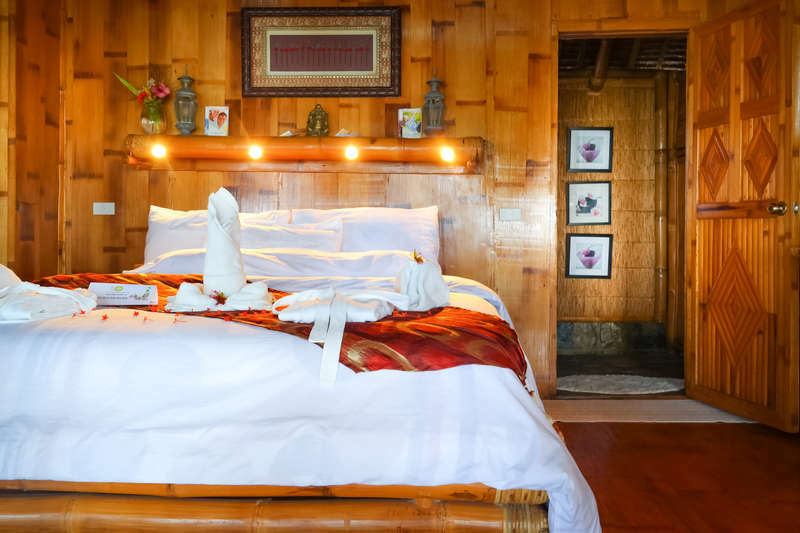 It is the most “Beautiful Asian Style Accommodation on the Island”, made of Bamboos and local material roofing combined with a European touch on our room bathroom and features. Only Three minutes away from the Sta.fe Sea Port and Three minutes away from the Town Business and Finance Centre, the luxury of being away from it all!!! 4. From Sta. Fe Port Bantayan Island, we will pick you up going to Coral Blue. Please be reminded that you must be in Hagnaya Port not later than 5:00 PM because the last ferry trip is 5:30 PM. In case you miss the last ferry, you need to stay one night in Hagnaya and plan your trip next day, as well please advise me the time of your departure at Hagnaya Port so that I can arrange your free pick up in Sta. Fe. Any cancellation received within 14 day/s prior to arrival will incur the first 1 night/s charge. Any cancellation received within 7 day/s prior to arrival will incur the full period charge. Failure to arrive at your hotel will be treated as a No-Show and no refund will be given (Property policy). -Children below 7 years old is consider free of charge. Consisting 2 kids per room only. -Each room is maximum of 2 persons only. Beyond this number of person will be charged PHP500 per night per person. -Above 8 years old is consider us adult and will be charged as exist person.